We wanted to feature our A Few Questions With Ryan Burke again, because we are so inspired by his talent and wanted to share not only his talent, but also a little piece of what makes Ryan, Ryan. What inspires him daily, who has been the biggest influence in his artistry career, what can season pros, along with artist just starting off in their career learn from him. Inspiration comes from anywhere – it could be architecture, it could be a plant. I get inspired by other people too occasionally, but I always take that piece of inspiration and pull it in my own direction. I think the important thing about “inspiration” is to spark an idea, not to replicate someone else’s work. My first big inspiration in my career is my ex and close friend, Oscar Ambrosio. We basically started in nightlife together at a time when instagram was only retro film filtered pictures of scenery and pets and there were maybe a handful of people in the world who were turning conceptual looks. Both of us loved dressing up and it’s how I started getting into makeup and shooting myself. Nobody was really doing this yet – shooting looks and putting them on social media. Neither of us knew how to do makeup and because it wasn’t big on instagram yet there were hardly any tutorials or examples for us to work from so we inspired each other. We taught each other techniques that we’d figure out and pushed ourselves to try any and every idea that came to mind. My next inspiration came when my friend introduced me to the work of Pat McGrath. I had been playing with makeup for a bit already but I knew nothing of major makeup artists. Seeing her work opened up my world. I was like “oh you can do THAT, you can take it THERE” so I started expanding on what I was doing and going more conceptual. My favorite was to do cut-out eyebrows because I couldn’t draw them on right at the time. I started with the regular eyebrow shape but it evolved to an obtuse triangle which became a signature shape for my style and has since been replicated by many people. My third inspiration came when I moved to New York to be a more “serious artist.” I met Domonique Echeverria at Greenhouse and we became close friends. It was actually my intention to leave nightlife and makeup behind in order to actively pursue photography but her influence gave me new inspiration for looks and I started taking things to a whole new level – I added in better styling and began making headpieces. Her aesthetic influenced mine to be more refined and fashionable. Can you tell us about a defining moment in your career? One that made you realize this was what you were going to do with the rest of your life. To be honest, I’m not sure what I’m going to do for the rest of my life. I’m not just a makeup artist and I’m pursuing whatever opportunities come to me in various mediums. However, as far as taking makeup seriously as a professional artist, that moment came when I began working on Pat Mcgrath’s team. I not only learned to refine my techniques to a more professional level but, I also got the validation I needed that I could be successful as a makeup artist. What advice would you give to a makeup artist or hair stylist starting out in the industry? Pursue the style you like to do the most but, also allow yourself to develop in other types of makeup and hair. Not only will this open up more opportunities and make you more valuable as a versatile artist but there can be a lot of crossover between different types styles. Work comes first in my opinion. In the age of the social media makeup artist, there are a lot of “personalities” who do makeup. While this is a career avenue that works out well for some people, being a skilled artist will most likely get you a more long-term career in the end. I also feel that as a matter of integrity as an artist, I would prefer to have the skills rather than being a personality who can’t actually deliver when it comes down to it or just puts out the same regurgitated generic ideas that have already been done hundreds of times over. What is the key to a successful work-life balance? If you love makeup and it is your profession then you should be enjoying your work as part of your life. But apart from that, make time to be in nature and disconnect from the world. I always have a need to do this in order to keep myself inspired and motivated. It is very draining at times to work a lot – even if you enjoy it and taking some time away from that makes you appreciate things more and keeps you sane. From our Fall 2016 issue Spotlight: Carl Ray Makeup Artist to Michelle Obama. Carl’s flawless and iconic work speaks for itself, and we were fortunate to get a chance to sit down with him and get the inside scoop. Carl told us how he got his start in makeup, his experience working with and what he does when he’s not on-call with the first lady and much more! Check out the full interview below and don’t miss our A Few Questions With series also featuring Carl Ray during The Artist Summit 2017. How did you get started in makeup? I found my passion for makeup when I was 14 years old. My parents were going through a divorce, and I would watch my mom applying her makeup for work and for her new life in the dating scene. That’s when I got the makeup bug. I asked my mom if I could help her with her makeup application because I thought I could do it better than she did. She said yes. I could see the confidence and happiness that my makeup application was bringing her and that sparked my passion and purpose. I have always viewed myself as an artist and deeply connected to not only the creative process of makeup but the direct impact that it has on women’s confidence and self image. Tell me about your experience working with the First Lady. From our Fall 2016 issue Inspired: Ryan Burke. We are in constant awe by the masterpieces of Ryan and if you follow his instagram page @ryburk you get a daily dose of inspiration from this artistic master. Makeup artist, photographer and Pat McGrath ambassador, Ryan is an artistic chameleon and genius, and we are forever inspired! Check out the full interview with Ryan Burke below and get one-on-one insight into how he developed his style of makeup, as well as what he finds challenging about creating each of his looks plus much more! How did you first develop an interest in makeup? My interest in makeup came from my friends and nightlife when I lived in LA. When I started going to clubs I wanted to dress up and do looks but I didn’t know a thing about makeup so I developed a style comprised mostly of glued on elements to decorate my face. In the meantime, I slowly taught myself different techniques starting with eyeliner and blocking out brows. I didn’t pursue it much beyond what was needed to do simple graphic designs because I had no intention of becoming a makeup artist, it was all just for fun. I was more serious about photography which inspired me to do self portraits as a way of documenting my looks. It wasn’t until I moved to New York that I got more involved in makeup. Do you have an art background other than makeup? From our Spring 2017 issue Beauty by Viktorija Bowers. Both a makeup artist and painter, Viktorija’s work showcases a blend of both her talents. Her paintings exude an ethereal feeling that translates beautifully into her makeup. From our Spring 2017 issue, Artistry by Moises Ramirez. His works is instantly recognizable and unforgettable, from his one-of-a-kind art to his gorgeous, artful makeup masterpieces. From our Fall 2016 Issue Kit Focus: Louie Zakarian – Louie has had a career that spans more than two decades with a range of experience that crosses over from film and television, to theater and live performance. He has toured with Paul Simon, designed makeup for Broadway’s Spider-Man: Turn Off the Dark, and has film and television credits that include Fringe, The Magnificent Seven, Southpaw, Requiem for a Dream, Across the Universe, Evening, P.S. I Love You and The Ministers. But Louie is perhaps best known as the makeup department head at Saturday Night Live for the past 20 years. The accolades for his work are heard far and wide and he took home the Emmy Award for his work on SNL in 2010, 2011, 2013 and 2015. Over his tenure at SNL, more than 50 cast members have come through his makeup room along with more than 100 guest hosts and more than 100 musical guests. To say that Louie Zakarian has been a part of the most important program in popular culture would be an incredible understatement. He and his team have helped SNL parody presidents — including Bill Clinton, George W Bush and Barack Obama — along with other political figures, sports stars and celebrities. SNL reminds us to laugh and to maybe, just once in a while, to be silly. It also remind us to not take everything so seriously. But one thing Louie takes very seriously is his makeup kit. We asked Louie to share some of the products that he can’t live without and that help to make his makeup room and FX lab two of the most impressive and important makeup artist work spaces in our industry. He generously obliged. INTENSELY PRO. COMPLETELY INSPIRATIONAL. REMARKABLY IMPACTFUL. Since 2003, we at The Powder Group have been creating programs and events that brought the pro makeup and beauty community together in new ways, elevated the artistry and business of the artists and stylists in our industry, and connected brands and pros in ways that were unique to our culture and energy. In 2008, we continued that journey and launched The Artist Summit event series. The program was an education forum and that provided a blend of business, artistry and community like few events in our history. In the next two years we brought the event to New York City, Miami and Chicago and thousands of pros came to join us on this new journey. 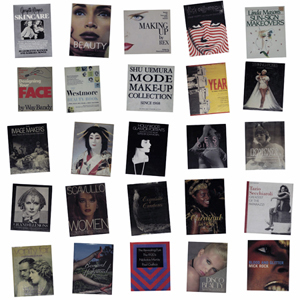 Some of the amazing beauty stories we have featured over the years by an incredible group of Makeup Artists and Photographers. Archive Beauty By Images above are listed by Makeup Artist name, followed by Photographer name for each row, Top to Bottom. Left to Right. Followed by Issue it was featured in. To subscribe to On Makeup Magazine print, click here. From our Summer 2008 Issue, these pieces of art were created entirely from makeup! From the Archive-Spring 2008 issue: SUGGESTED 25 Books. This list of books are timeless, in that they still hold relevance in our industry. They hold tidbits of inspiration and beauty that open our eyes to the expanse of possibilities when we as artists look upon a face, be it for editorial, bridal, commercial etc. We hope you find the beauty and inspiration in this suggested list, as we did when putting together this for our Spring 2008 issue.